Today it’s New Year for the Gujarati community. Its also Govardhan Puja day. Back in Mombasa its the day when we dress up in new clothes and go temple hopping… yes you read right not bar hopping but temple hopping. We visit all the Hindu temples in Mombasa, meet friends, relatives and acquaintances. After that it’s lunch at Ajay’s foi’s house. It usually is very hot around that time of the year so after a heavy lunch we need to take a nap. In the evenings we get ready and go to Patel Samaj to meet and greet our community people. Its also the day when I prepare some prasadam for the ISKCON temple in Mombasa. Its the only day when outsiders can prepare whatever they like for Govardhan Puja. But today New Year in Bangalore is quite different. Not attending any Govardhan Puja and may later go to a temple nearby. However, have spent the morning cooking as Nami’s friends are coming over for dinner. It probably will be her last Diwali celebrations with friends in Bangalore. She’s celebrated Diwali with them since she started college. Diwali next year will be quite different for her in Dubai. My post is not about New Year but about #Fall. Our #FoodieMonday#Bloghop group decided to prepare #Fallrecipes as our 64th theme. I’ve had the opportunity to prepare quite a few fall breads and other recipes. This time round I decided to use apple for my fall recipe. I baked apple squares so that I could participate in this week’s theme (missed the last 2 as I was not well) and also to give it to Nami’s friend as a Diwali present. Yesterday her friend invited us to her home for Diwali dinner. She made dal, rice and methi aloo for me(the only vegetarian:)). Each spoonful I ate was making me feel so emotional. I’ve known her friends for the past 12 years. They use to come home for Diwali and I would prepare dinner for them. Now they prepare dinner for me. Nami too is turning out into a fine cook and has her own style of cooking. My son Neel prepares food for us and I just cannot get over the fact that all my kids, their friends have all grown up into fine adults. 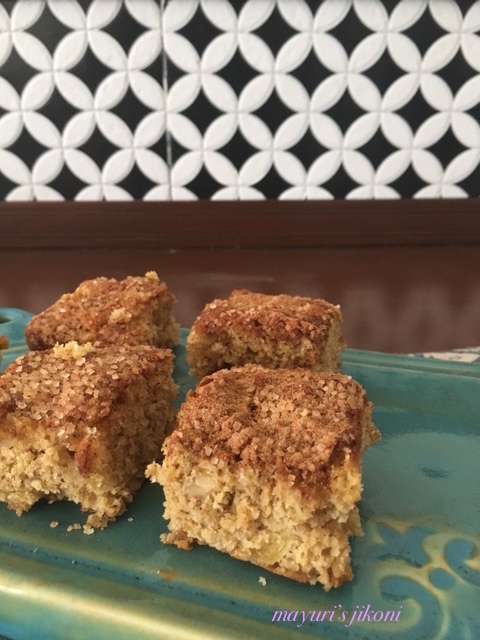 Today’s recipe is a simple to bake and tasty apple squares. Once you have the ingredients at hand it’s easy to put this recipe together. Fall means apples and cinnamon besides pumpkin, pears, berries and so many other veggies. One really cannot go wrong with the apple and cinnamon combination. So here’s the recipe, enjoy it with a cup of tea, coffee or even with a dollop of vanilla ice cream for dessert. Line a 8″X8″ square tin with parchment paper or grease it with butter and dust it with flour. To prepare the topping, mix the sugar and cinnamon powder. Sift flour, salt, baking powder and cinnamon powder together in a bowl. In another bowl add sugars both brown and white. Melt butter and add to it. Mix the butter and sugar well. Add vanilla extract, water and egg and whip it. Add the chopped apple and walnuts. Incorporate it into the batter. Spoon the batter into the prepared tin. Level it out gently with the spoon. Sprinkle the topping over the batter evenly. Bake for 25-30 minutes. A toothpick inserted in the middle should come out clean. Let the bake cool down completely in the tin. Add cinnamon powder in the topping according to your taste, either 1 or 2 tsp. I used a medium red apple for this bake. Happy New Year Mayuri, the apple squares is a good option for Diwali gift also. Apple squares looks so delicious dee!! Even in this diwali days, we can make and serve to our guests, Thanks for the wonderful share Mayuri dee!!! Lovely share MayuriDi! I'll love it more topped with some vanilla ice-cream���� Wishing you a blissful year ahead! Happy New Year Di.. Thanks for sharing this lovely recipe.. Will try out soon! Happy New Year !!! Apple squares look so tempting!! !Wonderful share !!! I've never heard of this root Mayuri and enjoyed your explanation of it. Your flat bread looks delicious!